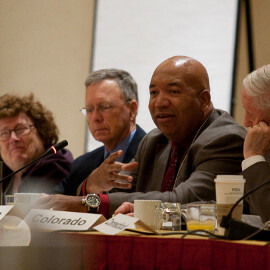 "Promoting Positive Mental, Physical and Social Adolescent Health"
The National Symposium on Juvenile Services is a unique forum that brought together the leadership and direct care professionals from juvenile services and other human services professionals. The Symposium provided an opportunity for training, networking, and sharing innovative program service approaches being implemented within the juvenile justice system throughout the country. In 2013, the 19th annual National Symposium on Juvenile Services was a collaboration between the host organization (National Partnership for Juvenile Services), the Office of Juvenile Justice and Delinquency Prevention (OJJDP), the National Center for Youth in Custody, the Coalition for Juvenile Justice, the Kentucky Juvenile Justice Advisory Board, the Kentucky Department of Juvenile Justice, the Kentucky Administrative Office of the Courts, and the Kentucky Educational Collaborative for State Agency Children (KECSAC).